Industrial Control Systems and PLC (Programmable Logic Controller) Products | ICED : Hitachi America, Ltd.
Hitachi PLC products establish a new standard in its class. Hitachi, Ltd., in Japan has been a world leader in PLC (Programmable Logic Controller) products, industrial automation systems and industrial control systems for more than 25 years. A worldwide sales and service network along with factory support centers is in place to assist our customers with Hitachi PLC products. Hitachi PLC products and Hitachi industrial control systems were developed with special consideration for network abilities, international standards and reduction of EMC noise. Due to an extensive array of commands, excellent communication capabilities and high flexibility, each series established a new standard in its class upon introduction. 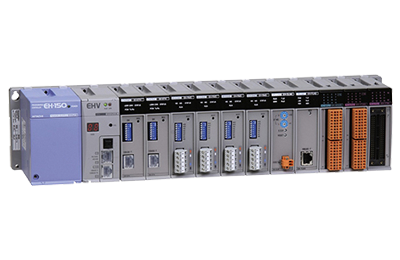 The ANYBUS® system ensures compatibility with industry standard fieldbus systems. Offers a variety of modules to suit various applications. The Number of I/O points can be increased up to 3,520 points using Hitachi's newly launched CPU, EH-CPU548. With the improved CPU, the processing speed is improved to 0.1us/command with an increased program memory of 48k steps. Compatible with a variety of open networks and through use of the onboard Ethernet interface may be linked to higher-level information processing systems as well as other PLC systems. One of the first general purpose PLC's in the world based on the CoDeSys V3 runtime system. The result is an open and flexible system, which is completed through utilizing existing EH-150 modules. Designed for plant engineering, featuring a high-performance CPU that is considered the ultimate of its class. Remarkable processing speeds of up to 0.05 µs/command allow the automation of all those tasks which a smaller PLC cannot handle. The Micro-EH Series PLC is a compact PLC with 12 bit analog I/O, built-in high speed counter, PWM and pulse train output with maximum 140 I/O points. Control Editor is an easy to use and comfortable programming software for the EHV-CPU series. Universally usable 32 bit Programming software for all Hitachi H-Series PLC. Flexible choice of editors considerably decreases programming time. Combines the advantage of standard Web and IT technology integrated in a compact PLC. Result is an all-in-one controller which offers a wide range of application possibilities.